What Does Give a Damn Mean to You? Why Give a Damn & What Does It Mean? Give a Damn can mean different things to different people and that's what I love about our Give a Damn tees! The idea behind the tee is to just get people thinking and caring about something greater than our own little bubbles we tend to live in. So today I'm asking, what does Give a Damn mean to you? What do you care about? Please comment I'd love to know! What does Give a Damn mean to me? To me, Give a Damn specifically means focusing on the impact of our consumer and daily lifestyle habits on the people & planet. That's one of the main things I give a damn about. My list could go on and on because I give a damn about A LOT. But mainly with my give a damn shirt I want to encourage others to think beyond. While in college I learned about the horrors of the fast fashion industry and this truly changed my life. I was shocked that people were dying and the environment was being harmed due to our consumer habits. This launched me into quite the journey of giving a damn....I started The Honest Consumer to educate others and point people in the right direction. 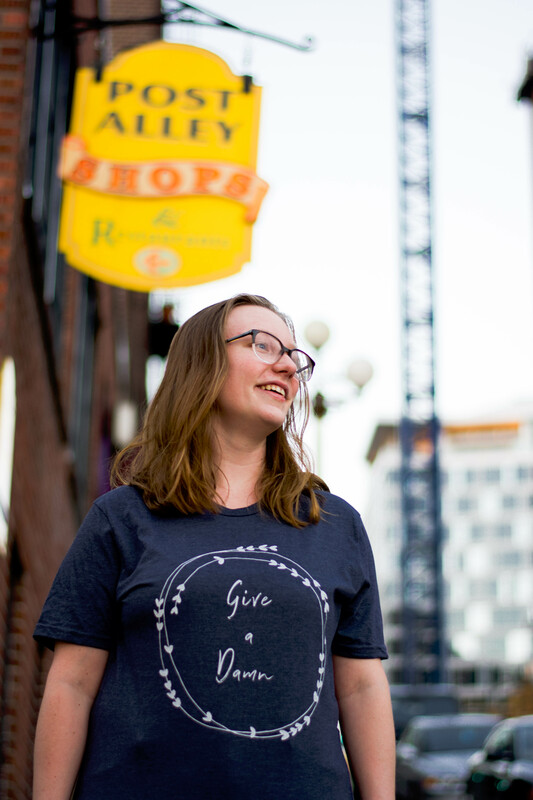 So with my Give a Damn tee I encourage others to learn about supply chains, learn about your impacts whether it's environmental impact, consumer impact, or something else, don't be afraid to learn about the ugly in our lives because that's the start of real change. Raise awareness for what you believe in and help educate others! So I invite you to share! What do you give a damn about? I'm launching a section of the blog where we share our community Give a Damn stories! Share with us what you give a damn about and what inspired you to care? Share your story and it might end up in a super cool blog post like this!